My husband and I received several ceramic art pieces, one of my favorite art forms, as wedding presents. One of my favorite manifestations of this genre is the ceramic art of the Carolinas. I can’t think of any other cultures that made as compelling of ceramic works with faces other than the Moche in Peru. In Southern ceramic artwork, face vessels originated with pre-Civil War (1860–1865) African American potters, possibly influenced by their contact with wares they saw in the Caribbean on their way to slavery in the US. 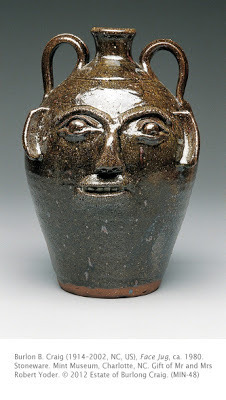 The genre eventually migrated to the rich ceramic art environment in other southern states, particularly North Carolina. German immigrants and German-American descendants settled in North Carolina’s Catawba Valley in the late 18th century as farmers who brought their pottery-making tradition with them. For over 200 years the farmer/potters of the Valley produced utilitarian storage vessels, including churns, milk crocks, preserve jars, molasses jugs, meat and grain storage jars, and a variety of tableware. The advent of refrigeration and mass production nearly killed the centuries-old pottery tradition in the region, but it has revived spectacularly. Native bands such as the Cherokee and Catawba in western North Carolina had ceramic traditions the extended well before the arrival of white settlers, primarily pit-fired wares. Alkaline glaze is a Southern ceramic tradition initiated by German immigrants to North Carolina’s Catawba Valley in the late 1700s. The term “alkaline” refers to the flux, the material used to lower the melting point of the glaze. In the South, lime and wood ashes are most commonly used. To achieve the glassy surface, potters use clays with high silica content, iron slag, sand, or even bottle glass. The German settlers and their descendants produced earthenware until the early 1800s, when they switched to stoneware. Burlon B. Craig of Vale, North Carolina, was one of the last of the traditional North Carolina potters to work in alkaline glaze. He is credited for having kept the traditional methods of production, forms, and glazes once prevalent in the Catawba Valley alive by mentoring other potters to adopt traditional methods along with their innovative techniques and material. He dug his own river clay from several locations, including a South River pit once used by the Catawba Indians. While Craig’s utilitarian wares were extremely popular, he became famous for his face jugs, a traditional favorite with tourists since the 1920s. The face jug had been adapted by the descendants of German settlers during the late 1800s from African Americans. The jug was used as “child-proof” to scare them away from the contents in the jar, usually home-made alcohol. Among African Americans, in the tradition of African burials in which household personal items were included with a deceased person (like many cultures around the world), such pots were often set on graves. If the pot would become broken, it was assumed that the deceased was having a fight with the devil. Studio activity: Make an expressive face pot. Take a lump of clay and form it into a ball. Using the thumb, create an opening (hole) in what will be the top of the pot, and work the hole bigger, thinning and smoothing the interior and outside of the walls of the pot until it is the desired size and shape. Apply nose, eyes, lips, and ears with separate pieces of clay, or use a pencil or other sharp tool to incise the lines of the eyes and mouth.